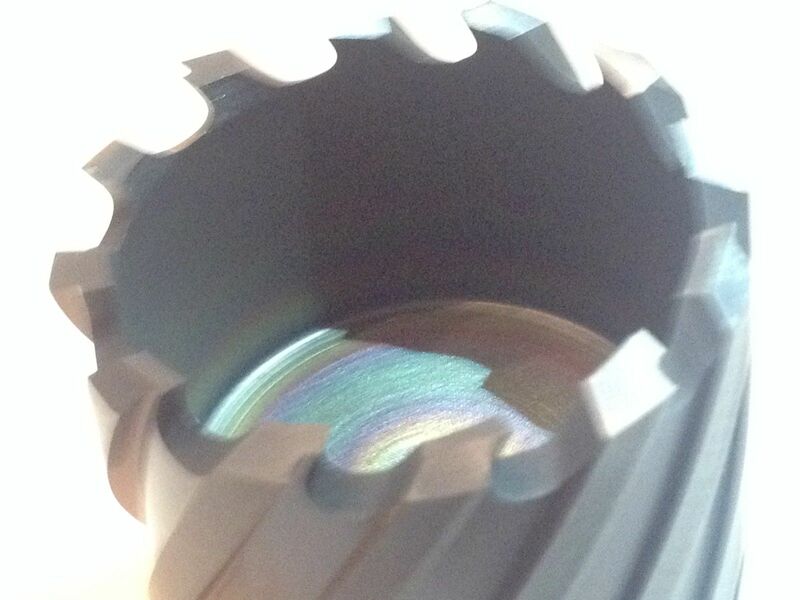 When producing holes through harder materials like stainless steel – it is recommended to use a harder annular cutter to increase tool life and keep the drill speed up to the optimal rpms. The Bison Tialn coated annular cutter makes that affordable. TIALN COATED: Titanium Aluminum Nitride ( TIALN) is a thin film coating that was developed from Titanium Nitride. TIALN offers higher temperature resistance than TIN, as well as slightly higher hardness and especially higher hot hardness. This coating works by forming a thin surface layer of Alumina ( AL203), or Aluminum Oxide ceramic. As the layer wears it continuously reforms. – Tools typically last 3-10 times longer than uncoated tools. Use this coated tool for longer tool life or for cutting harder materials such as stainless steel, harden steel, etc. Does not require very much lubricate, in fact, the hotter the material is processed, the better the coated tools work. Cutters made from M2 high-speed steel (HSS) are recommended for materials with a Brinell hardness number (BHN) of up to 275. A titanium aluminum nitride (TIALN) or similar coating may be applied to M2 to fortify wear resistance in materials up to 325 BHN. For materials up to 350 BHN, cobalt steel (M42) is recommended with a titanium nitride or similar coating.